Content 4 different media: mineral stone, biocerarmic balls, negative ion balls, mineralized balls. Release soluble essential minerals back into water such Calcium, Magnesium, Sodium, K, P, Zn, Se, Mn, Sr, etc. Only natural media and stone. Service life: 1500 gal. Comes with 1/4" thread x 1/4" tubing elbow fitting (2), clips (2), piece of 1/4" OD tuning(2). 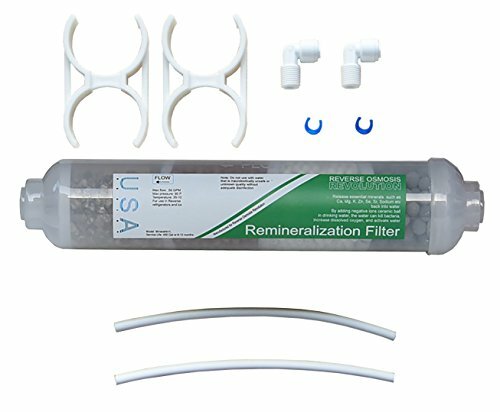 If your Reverse Osmosis system has 3/8" tubing, please, contact us before purchase this item. We can ship separate package for 3/8" OD tubing. Release soluble essential minerals back into water such Calcium, Magnesium, Sodium, K, P, Zn, etc. If you have any questions about this product by Reverse Osmosis Revolution, contact us by completing and submitting the form below. If you are looking for a specif part number, please include it with your message.